Incredible but true: Chvrches started out as a side project. What began as Iain Cook (ex-Aereogramme/The Unwinding Hours) and Martin Doherty (previously part of The Twilight Sad’s live band) inviting Lauren Mayberry to sing on some recordings they’d made together—all arising out of Cook producing an EP for Mayberry’s old band, Blue Sky Archives—has turned into a synth-pop force of nature that sold half a million copies of their debut album, 2013′s The Bones of What You Believe. That level of success seemed to have come out of left field, and Chvrches themselves didn’t see it coming, either. What their debut lacked in thematic unity and consistency, it’s made up for on sophomore album Every Open Eye with the sort of songcraft that belied the fact that they had all come from vastly different musical backgrounds. Every Open Eye takes the best parts of its predecessor and improves on them in every conceivable way. Two years spent touring has gone a long way towards helping them find themselves and put to rest the hesitancy that bogged down parts of their debut. Its sound is no great leap from what came before, but then, it didn’t need to be—Chvrches are just writing smarter, thinking bigger, being bolder, exuding the sort of confidence displayed by Mayberry when she takes down online misogynists, as she’s needed to do numerous times, most recently in the wake of the “Leave A Trace” video release. 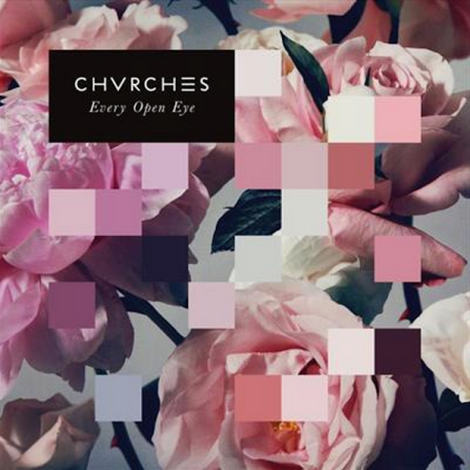 That’s exactly what Chvrches have done on Every Open Eye. There are no jarring tonal shifts like there were at key points on the debut, and while Iain Cook’s vocal presence remains slightly underused (he takes lead on just one track, let loose on the soulful “High Enough To Carry You Over”), Mayberry is in fine vocal form; she sounds more self-assured than before, reaching for the rafters on the comparatively somber “Afterglow,” backed by a wall of synths that threaten to erupt, but are instead subdued for a hushed coda, Mayberry repeating “I’ve given up all I can” to bring the record to a stately close. It may not be the valedictory finish an album as colossal-sounding as this could benefit from, but it works wonderfully as an epilogue and is one of the most beautiful songs in their catalog to date. They started from a chance meeting, but on their second album, Chvrches prove that they’re more than just a side-project—they mean business.